Wonderful apartment "THE NOBLE FLOOR" IN MAJESTIC VILLA VENETA In the heart of Asolo, one of the most evocative villages in Italy, also called "the village of a hundred horizons" in reference to the legendary view, today also UNESCO's word heritage, stands the impressive and majestic Villa Pasini-Scotti, overlooking the central square. 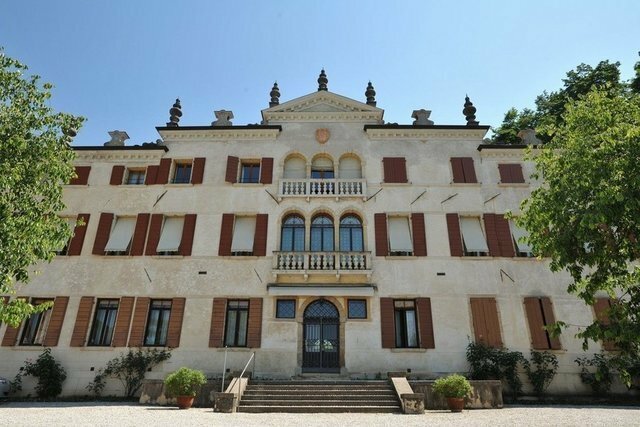 The first documented settlement dates back to 1571, during the 16th and 17th centuries the villa was enlarged and completed until it reached the height of its splendor. The latest changes are made at the beginning of the twentieth century and in the 1996 the villa was restored, bringing it back to its ancient glory and beauty. Currently the villa is divided into several residential units: one on the first floor, two on the second floor and another independent "dependance" unit, outside the main complex of the villa The first unit represents the "piano nobile" (which is a device used in the Renaissance), on the first floor, and is accessible from the back of the building, through the wooden bridge leading to the main entrance. Inside, the main body expands according to the typical Venetian style with the central hall open on all four rooms. It is presented in the following way: elegant lobby with a lodge, a central hall, 1 large living room, second living room, 2 studios, 3 bathrooms, 4 bedrooms, a kitchen and a separate dining room and a laundry, for a total of about 500 square meters . Everything has been tastefully renovated and furnished in an exemplary manner. Of considerable interest is the fine stucco decorations of the late eighteenth century, neoclassical, preserved in walls and ceiling of the noble floor. The view is priceless: from the large windows you can admire the village below and the hills on the horizon. All units share the garden, the greenhouse, the boiler room and the main floor has a double parking space in the common garage. Possibility of selling the entire property or individual housing units. It is possible to sell the apartment also furnished (forniture price separately).